These wildly successful ads captured the essence of one very unique management team that was a bit wild and crazy  but who would do anything for the customer. The campaign rang true and dramatically increased both the visibility and credibility of Matrix. 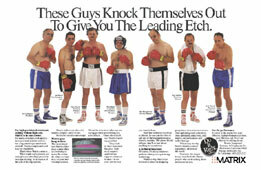 And virtually everyone in the semiconductor industry still remembers these ads.